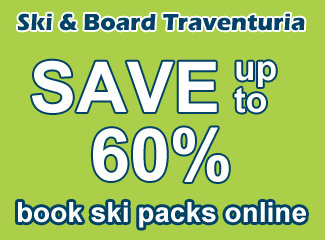 At Ski & Board Traventuria you will find skis of Head, Rossignol, Fischer, Nordica, Elan, Stockli etc. Different skis feel and ride differently and picking out whats best for you can sometimes become a real headache. If you’re not 100% sure what you need to look for in a ski this guide will hopefully give you some insight. We will examine the different types of skis and parameters that affect handling. This text applies not only for people looking for rental skis, but for those of you who want to buy their own. Rental Skis or Buy your own? Something that I notice quite a lot with my friends is the urge to buy skis, before they’ve even tried the sport. If you’ve never skied before or are a beginner I would suggest sticking to rental skis. That way you will know whether you like the sport and what kind of skis are good for you. Also, you should keep in mind how often and where you ski. If you like to go on a week long ski trip once a year by plane, then owning your own may not be the most practical choice. For the other 51 weeks of the year they will just be sitting in storage and taking up space. Then you’ve also got transportation taxes and hassles carrying them along. In these cases it’s much easier to rent skis every trip. But if your an intermediate or expert skier, who knows what they want to do with their skis and ski often, it may be a great idea to own your own. Also if you have a ski slope within driving distance, owning your own skis will save you time and money in the long run. The two main things you should keep in mind when choosing a rental shop is it’s location and quality of equipment. Its always better renting from somewhere close to the slopes or gondola. This will mean less time carrying your skis and more energy for actually riding them. Most decent ski shops allow you to leave the equipment there over night, so you don’t have to carry it to your hotel every day and stuff it in the corner of your room. 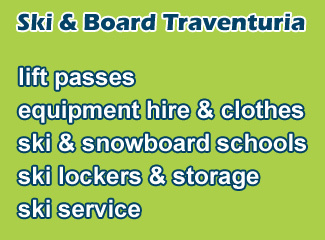 Another extra Ski & Board Traventuria offer is the option to purchase your skis after rental. If you really liked the skis, buy them, your rental tax will be deducted from the price and they will be shipped to you. I picked a shop, now what? Beginners – The ski should reach somewhere around your chin. Shorter and it will be less stable, longer and it will be harder to turn. Intermediates – The ski should reach somewhere between your chin and nose. The longer ski required due to the faster speeds that intermediates ski compared to beginners. If your renting freestyle/freeride skis, then go for even longer lengths. If you weigh more than average for your height you should go with longer skis. If you weigh less than average for your height, then go for shorter skis. Also, shorter skis make turns much more quickly than longer skis. While longer skis are more stable at high speeds. Different skis vary in how stiff they are. There is no exact index for ski stiffness, but they are generally divided into soft, medium and hard. The softer range of skis are better suited for beginner skiers. Softer skis are easier to turn and more forgiving if your technique is not so good. The downside is that they can be unstable at higher speeds. That’s why intermediate skiers should go for something stiffer. The stiffer the ski is, the more grip it has at higher speeds. Imagine race car shocks, fast sports cars have stiff suspension for more control at speed, but its unpractical if you’re just cruising down the street in a 64′ Impala. Expert race skis are probably the stiffest skis out there, as they need to be able to hold the edge at over 100 km/h on pure ice. In the world of twin-tip skis (for freestyle/freeride) it’s down to personal choice. I personally prefer skis with a medium stiffness as they are stable enough for my riding and don’t tire me out. Sidecut, or turn radius, determines how long the ski’s turns will be if you are carving. They also give an idea if the ski is good for quick short turns or long high speed carving. Beginners: I would suggest something with a smaller turn radius, around 13-14m. If you’re just starting out skiing you won’t be doing long carving turns and you should be looking for the ski that is easiest to turn with. Intermediates: I would suggest something with a slightly longer turn radius, so that you can start learning to carve and make longer turns. Expert: Here it’s down to personal choice again. I personally prefer skis with a longer turn radius, as i’m not really a fan of short turns. For instance, my freeride skis have a turn radius of almost 40m, which is perfect for big mountain riding. If you are a beginner skier I would suggest that you just ask in the shop what is best for you. I have often seen people rent race skis and complain how bad they are, just because they can’t ski them properly. 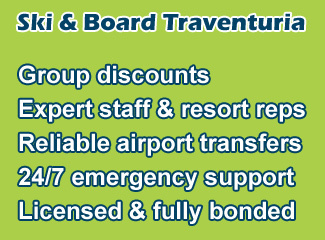 Ski & Board Traventuria rental shop in Borovets offers the best variety and new models of skis in the resort – all of them fully serviced after each rent. More than 15 brands in all lengths between 67 and 193 cm. Save 10% by booking online. Also make sure to check out our guide to picking ski boots HERE. If you still have any questions feel free to comment below or get in touch with us via Facebook or e-mail.